I’ve never been a very productive person, so I’m relishing my current spate of home-made produce, which I hope will only increase in future. 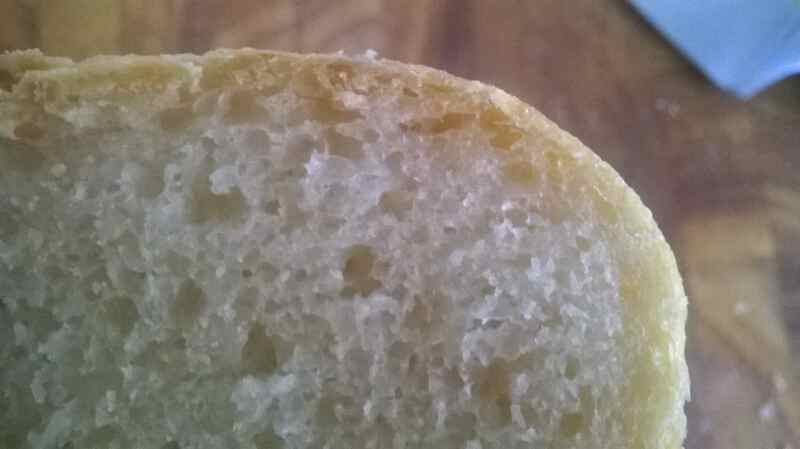 In the past I would have found any number of obstacles to every item I’ve thus far produced; even something as simple as not being able to find strong flour for bread-making at my local supermarket. You could say I was a little too easily defeated. I’ve been reflecting on my progress thus far, and have to give credit to two elements that have inspired all the subsequent productivity. Firstly, my brother and his wife got me started on roasting coffee, which in many ways remains the easiest, quickest, and most rewarding activity. It meets the ideal of providing a high-quality product at or below commercial prices. Half an hour of roasting literally doubles the value of the coffee beans. Other adventures in home produce have followed this same goal – creating something that tastes as good as or better than anything I could afford, but at a much lower cost. The second major element is all thanks to my friend J, over at Gray’s Brewing. J did everything to get me brewing, short of threatening physical violence: before heading overseas he showed us the process from start to finish, and left us with a cube of wort, a bunch of fermenters, a freezer, a sachet of yeast, and assorted bits and pieces in what is effectively the brewing equivalent of pre-chewing your child’s food so he doesn’t choke on it. Brewing all-grain beer likewise produces a high quality product at much lower costs, but unlike my coffee roasting, it also introduced a number of basic technical skills and equipment that have lowered the cost of entry to other products. For example, if it were not for brewing beer, I would never have tried brewing rice wine. If it were not for the rice wine, I would never have started brewing soy sauce (don’t worry J, I’m using my own fermenter for that). All three require fermenters, familiarity with yeast fermentation, and for the latter two a familiarity with Aspergillus oryzae. Beer also required the use of a thermometer, which, as simple as it sounds, was otherwise an obstacle to producing yoghurt. Producing yoghurt led to simple mozzarella cheese (more complex cheese to follow). 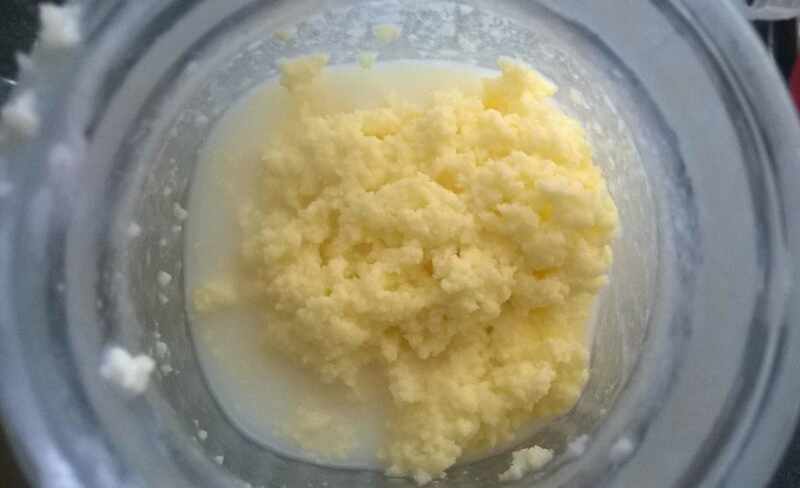 Cheese and yoghurt are both closely related to butter, with yoghurt providing cultures for both, and butter producing buttermilk as a by-product, which is (in name at least) in turn useful for the cultivation of a different variety of cheeses. Making the soy sauce required a huge amount of brine, for which I used my brewing hydrometer to establish the specific gravity and hence salt-content of the brine. 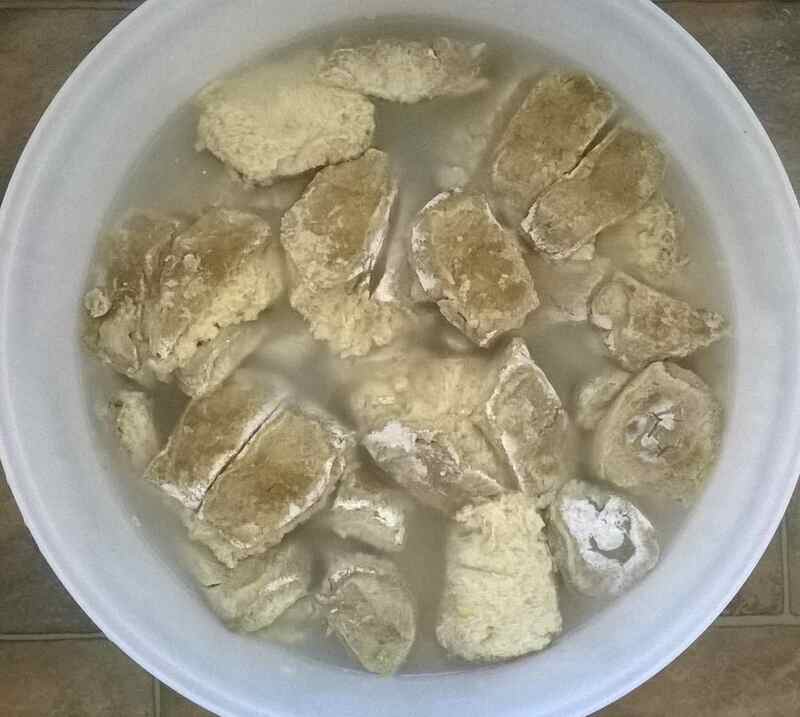 Having made so much brine for the soy sauce, making another brine to wash the butter was no obstacle. Salt has been the common ingredient in both the soy sauce and the bacon, and with lemons coming into season we’ll likely be using it to preserve lemons as well. Preserving lemons will be easy now that we have the mason jars purchased for the sake of the pasta sauce; mason jars that turned out to be very handy for making and storing yoghurt, as well as for whipping cream into butter. I even used a mason jar the other day to store cold-pressed coffee, an experiment which proved dangerously good for making impromptu iced-coffees. If you’ve read this far, what I’m getting at is that there’s a basic knowledge and familiarity with these various ingredients, techniques, and skills that lowers the threshold to an array of wonderful products. They are interconnected in surprising ways, such that I could, in the near future, have a bread dough, yoghurt, cheese, beer, soy sauce, and rice wine in the one fridge, all undergoing varying permutations on the fermentation of yeast or culture of bacteria. I’m struck by how limited my knowledge and skills were before, and how enriching by contrast this new-found productivity has already become. Today there was so little liquid leached from the curing pork, I decided to begin the air-drying process at last. Rinsing off the cure and patting the meat dry, it’s clear how much the curing process has changed the meat. I bent some old metal roast duck skewers into hooks, and hung the two pieces of bacon in our laundry. From what I’ve been reading online, it’s possible these will turn out stupendously salty. If that’s the case, it is possible to soak the rashers in water for about an hour before use to remove some of the salt. I made it from cheap supermarket cream (pure cream without thickeners is hard to find) by shaking it in a jar – hence the exhaustion. It’s a strange experience to shake the cream until it becomes so thick it hardly seems to move, only for it to suddenly separate into solid milk fat and liquid buttermilk. 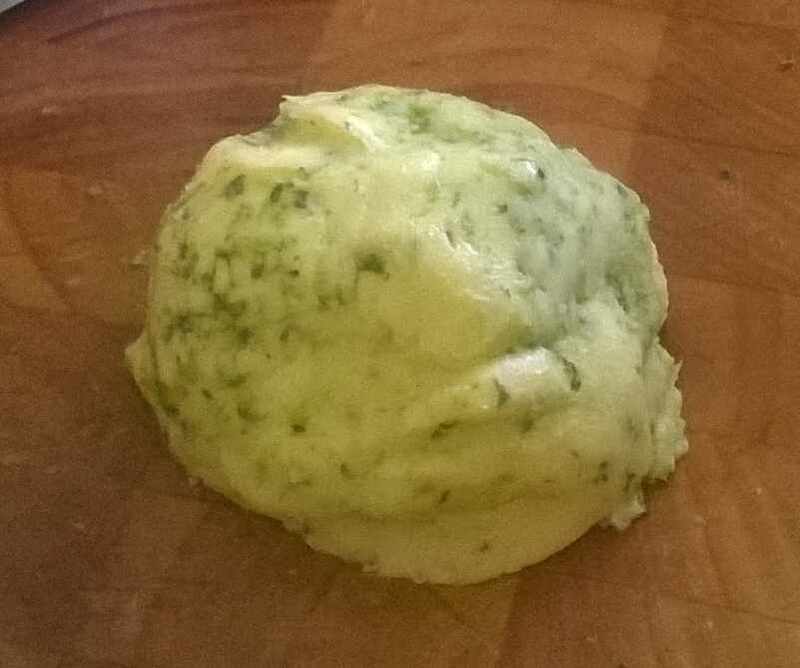 We washed it a couple of times with brine, and then kneaded in ground parsley and garlic. 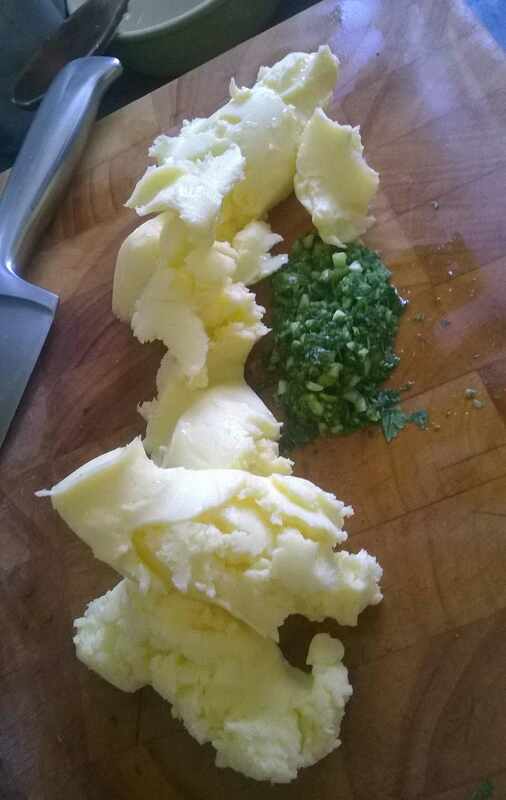 I’m keen to try the cultured butter next time. Will keep you posted. Pictured above is day 2 of the magical process that turns pork belly into delicious air-dried bacon. Every recipe I have read emphasises two points about making bacon: first, it is very very easy; second, it is amazing. We’re doing a non-smoked air-dried bacon, based on a recipe from the River Cottage ‘Pig in a Day’ program, with added-confidence from this family homestead site in the States. 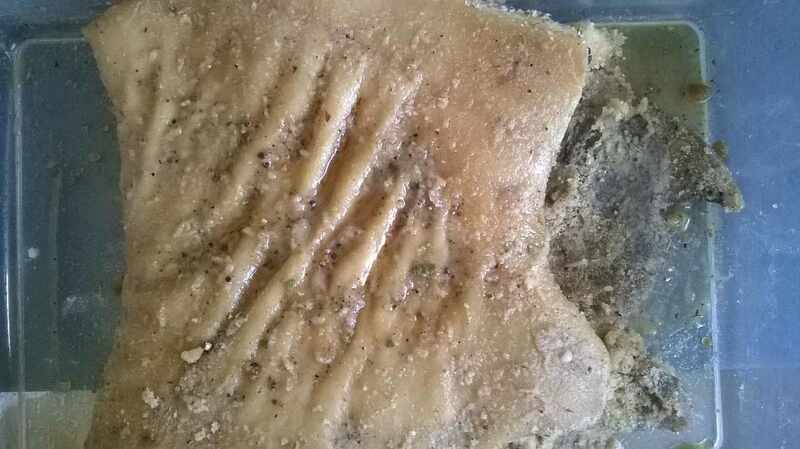 Each day we rub the pork belly with a cure of salt, brown sugar and various spices (we added pepper, bay leaves, star anise and onion powder). After 24 hours in a cool place (a broccoli box with a frozen water bottle inside) the cure has leached a cup or so of liquid out of the meat. We tip out the liquid, and rub the pork again with fresh cure, making sure to coat every gap or flap of the meat. 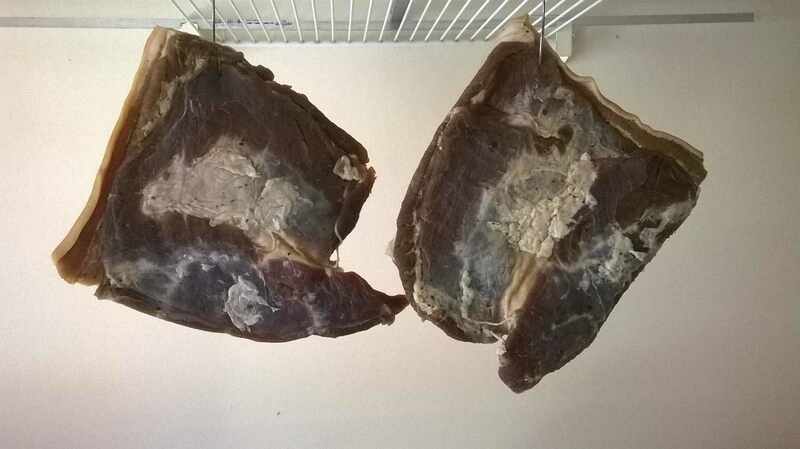 In theory, after about 10 days the meat will have leached its last, and can then be rinsed thoroughly, dried, and hung in a cool dry place. Read a few recipes before you try it for yourselves. I’ll keep you posted on our progress, but hopefully we’ll be enjoying some incredibly tasty bacon in about 7 days time! If you don’t hear back from me, I’m either dead from food poisoning or too full of bacon to type. You can officially add soy sauce to the list of things you probably would like less if you saw how it was made. What you are looking at is a batch of soy and wheat cakes floating in a fermenter full of brine. The white stuff is Aspergillus oryzae mold, the same mold used in the fermentation of rice-wine. The procedure from here on in is apparently to leave the fermenter in the sun for the next three months or more, stirring it twice daily. Traditionally the pots are left uncovered, but I’m a bit wary of local wildlife, curious passers-by and air pollution from nearby traffic, so we’ll be keeping it mostly closed. As strange as it sounds, I’ve been really yearning to make soy sauce since it occurred to me a couple of months ago. From what I’ve read, traditionally brewed soy sauce has pretty amazing flavours. It’s one of those ideal situations where the home-made product can outstrip the commercial varieties without much difficulty. I’m hoping to get somewhere in the vicinity of 20 litres, with the cost of ingredients at about $10. But the flavour is much more of an incentive; and while my beer and rice wine tend to disappear quite quickly, I like the idea of ‘cellaring’ a few bottles of soy sauce for years to come. Making pasta sauce was not my idea, but it has turned out to be a productive activity that lends itself to a nice day-long communal activity with a shared meal at the end. A friend was inspired by the same principles noted in other projects on this blog: we could make the same or better than the commercial product at a fraction of the cost and with the added enrichment of actually producing something rather than being mere consumers. 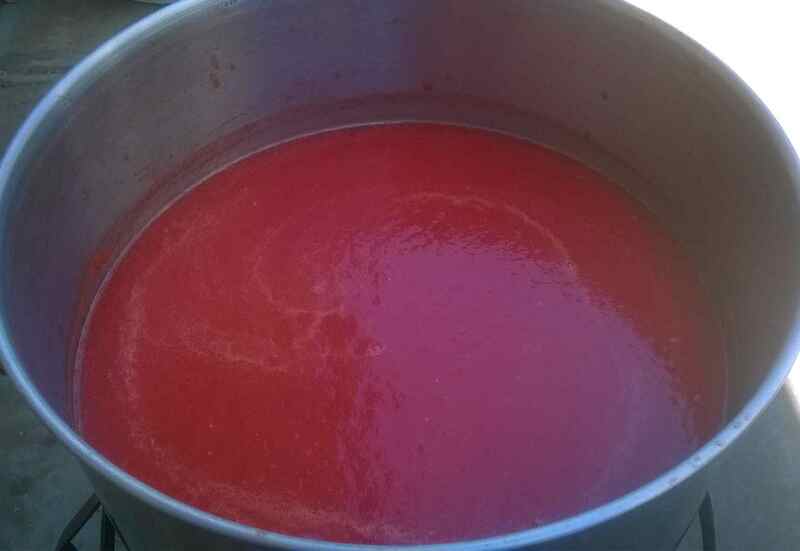 My friend has a handy appliance with a number of attachments that enable him to make pasta sauce – stripping the tomatoes of their seeds and skin, make dough for pasta, knead the dough, roll the dough in progressively thinner sheets, and finally cut it into spaghetti or fettucine. Fresh pasta with fresh pasta sauce tastes quite different from the typical store-bought stuff. I’ve never had it before, and what was perhaps most noticeable was the absence of cruder flavour associated with cheap dried pasta and overly sugared, salted, and acidified pasta sauces. Homemade pasta sauce is a little more intimidating than my other projects, as it carries the unspecified risk of botulism poisoning. However, no one has died yet, and I’m pretty confident that this batch will be okay! 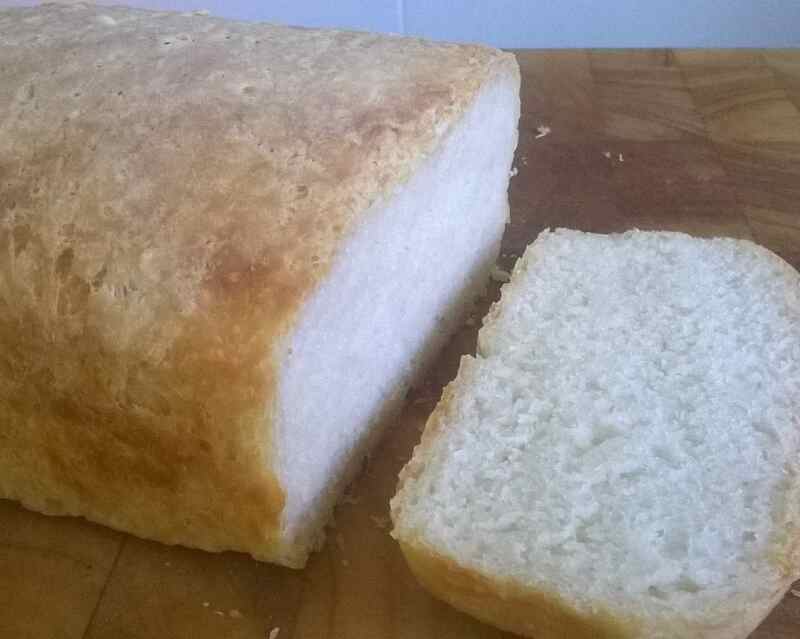 I just baked my first proper loaf of bread, three days in the making. Everyone who’s ever made their own bread has told me there’s nothing like it fresh out of the oven. But like the sleep-deprivation of early parenthood, you can’t really appreciate it until you experience it for yourself. 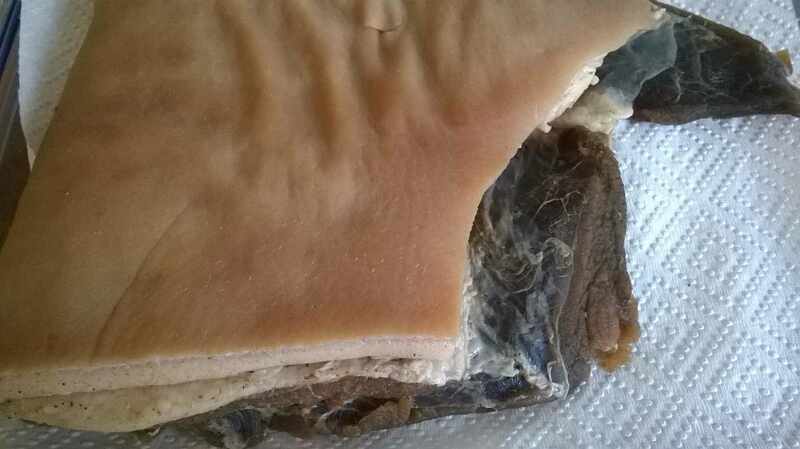 I followed a very simple recipe for homemade sandwich bread, and I’m pretty sure something went wrong along the way. Maybe my scales are out or Australian water is dryer, but I ended up with what seemed like quite a dry dough, and hence (I think) a relatively flat loaf. Regardless, it tastes amazing, and I can really appreciate the flavour imparted by the days spent quietly resting in the fridge. I wish you could taste it, but there’s unlikely to be any left by the time you get here. I’ll most likely try again with the same recipe to see if I can get it to rise more. Tis almost Christmas and I thought it fitting as I sit here consuming home-made rice wine to fill you in on the progress of my varied exploits in home economy. I’ve never been a big fan of yogurt, but since I discovered I could make delicious fresh yogurt for $1 per litre, my consumption has dramatically increased to reach parity with production. It seems that the more yogurt I produce, the more I consume; and while part of me is curious to find just how far this relationship goes, the rest of me is a little scared. At the same time, I discovered that leaving a 3 litre jar of yogurt lying on its side in the fridge is a good way to separate the whey, leaving us with extremely thick yogurt. Given the dynamic relationship between brain and digestive tract, I’m also curious to see the long-term effects of increased yogurt consumption. Will eating yogurt make me a happier, nicer person? The rice wine is going strong. I pasteurised one bottle at 85 degrees for about 10 minutes which killed about half the flavour. Not a great move. The second bottle I heated to 70 for 10 minutes, and it retains most of its flavour. In fact it’s more drinkable than the unpasteurised bottle, which has too strong a flavour. I have three batches of rice wine on the go: ten cups of rice in a fermenter, and five each in two large jars. The rice in the fermenter was soaked in water for a day before steaming in a bamboo steamer. The rice in the two jars was soaked for two days, at which point it turned sour and fearing the worst I washed it thoroughly and set it to ferment (after steaming) apart from the first batch. Nonetheless both the fermenter and the two jars are doing well. The spread of the white mold is visible, and liquid is now forming, just over a week into the process. My Bright Ale turned out too dilute due to an inexperienced error in the boil. I’ll adjust future recipes. Chilling the beer to near freezing, it is still quite enjoyable, especially after a night run, but the first few litres I was saddened at the thought of what might have been. I’ll try to do a Golden Ale on Boxing Day, as my supply is running dangerously low! I cooked up a batch of Ginger Beer for Christmas, and have yet to try it. I’ve been disappointed in the past at the inefficiency of the ginger extraction in the existing recipe we’re using, so in light of that and the exorbitant price of ginger, I used less of it but cooked it in a pressure cooker for about an hour. Normally there’s enough flavour left in the ginger after boil to bake a cake or biscuits, but this time it was flavourless dross. Success! However, it’s possible that the high pressure/temperature might alter the flavour a little. Will have to wait and see. In the meantime, I’ve found a reputable Ginger Beer recipe that starts from scratch so hopefully I’ll give that a go in the near future. We’ve had a couple of popcorn machines die on us. Could be bad luck or a change in the tolerances of the machine, but either way it might be time to look for an alternative brand of machine or failing that an alternative method of roasting beans. There are a few other cheap methods. If worst comes to worst a heat gun and a dog bowl will do. That’s about all there is to report at present. Future experiments may include bread, limoncello, noodles and pasta sauce. Update: these days I heat the milk in the saucepan, not the jar, as this allows me to quickly cool the milk by placing the saucepan in a sink full of cold water. If you heat and cool glass too quickly it will break; so it’s much safer to use the saucepan instead. In brief then: heat the milk to 85 degrees (not too fast or it’ll burn on the base). Cool it or let it cool to 49-44 degrees. Stir in a tablespoon or more of existing yogurt (commercial or home-made). Pour into jars or plastic containers, whatever you like. Put the lids on and keep warm for the next 4 or more hours. I put mine into a broccoli box (Styrofoam box with lid) and with a towel inside to isolate even further. I typically leave it for more than 5 hours to get an especially thick yogurt. I’m currently doing 3 litre batches every week and a half. I’ve also tried it with skim milk for a friend, and the result is apparently still very good. Probably the easiest thing I’ve made so far. You’ll need a large jar with a lid, a saucepan, a cooking thermometer, some commercial yogurt (preferably unflavoured and good quality), and a way to keep the new batch of yogurt warm. I have a nice purpose-built insulated container for the jar, but you could simply wrap the jar in a thick towel and put it in a bucket to keep it upright. 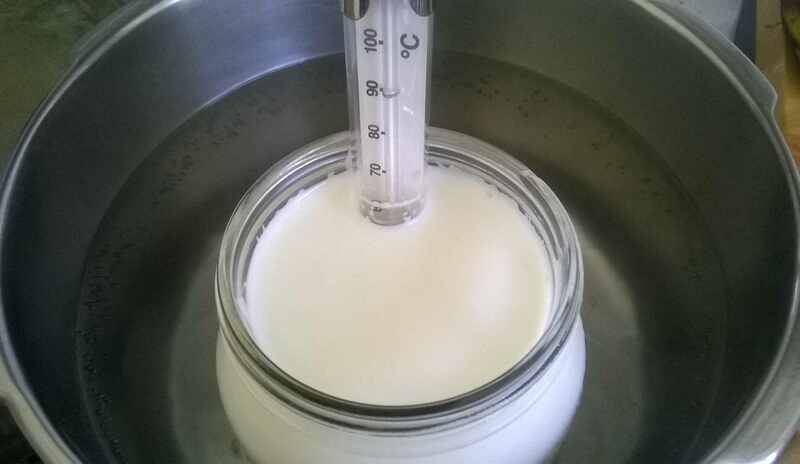 Heat milk to 85 degrees C, then allow it to cool to 44 degrees. You can heat it directly in the saucepan or put the milk in the jar and heat the whole thing in water as pictured. At 44 degrees add a heaped tablespoon of commercial yogurt and stir through, then pour it into the jar, put the lid on lightly, and wrap it in towels or use whatever method you have to keep it warm. Let it sit for about 4 hours, then tighten the lid and put it in the fridge. The longer you leave it warm, the firmer and more tart the yogurt will be. I’ve used this method three times in the last week and a bit, and last night I made an extra large batch, giving me three litres of yogurt. Fresh yogurt is pretty amazing. You can add it to fruit or blend favours with it after it’s chilled, but I haven’t tried that yet as the fresh plain yogurt is so good on its own. When you near the end of the batch you can simply repeat the recipe, using your own remaining yogurt instead of commercial yogurt as the starting culture. If the yogurt doesn’t seem as effective at any point, you may need to buy more commercial yogurt to restart the process. Milk here is about $1/litre, which is a very good price for an easily-replenished supply of fresh yogurt! There are similar processes for making buttermilk, which can in turn be used to produce sour cream, creme fraiche, and cottage cheese. Will let you know if I get around to making those.